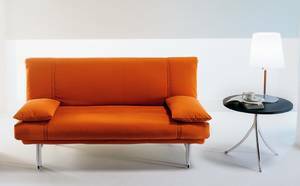 Description Available in 3 sizes, Amico is a funky modern sofa/armchair that transforms into a bed. 12cm thick polyurethane/wadding mattress and fully removable fabric covers, available in a variety of colours. A large quilt cover means the bed is always ready to use. The sturdy metal frame has a silver painted finish and the springing is provided my beechwood slats. Cushions and headboard piece can be bought seperately.